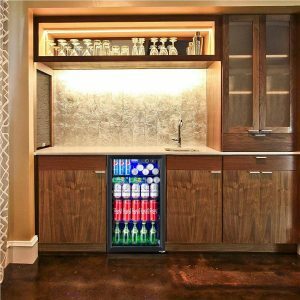 Costway 23232-CYPE is a number one new release 120 can capacity mid size beverage fridge with a stainless steel trimmed clear double paned glass door for your beer and soda cans as well as wine for use at home, bar or office. It has a rating of 3.9 out of 5 stars by 11 customers which is an acceptable overall satisfaction score. You also have two other options on the product page, the smaller 60-can capacity (Costway 23231) about 40 dollars cheaper and the same 120-can fridge with yellow light with the same price tag. It offers flexible storage for a variety fo your beverages and can be used both as a built-in or freestanding unit. It has four adjustable and removable chrome shelves with different heights that let you store your short and tall beer and soda cans and wine bottles. The maximum capacity of 120 cans is for the standard size 12 oz. short cans. You’ll have less space if you put in taller cans or bottles. The thermostat can be adjusted easily manually with the three level temperature knob for a temp range between 39 and 61 degrees Fahrenheit. It offers quick and efficient refrigeration with a powerful R600A compressor (70W, 115V,60Hz, 0.8A) that cools down quickly, gets to and stays at the ideal temperatures for your beers and other beverages. 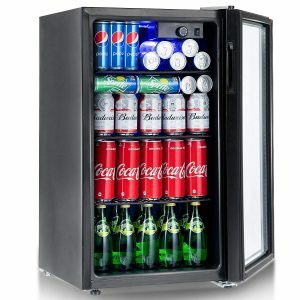 Costway 120-can Beverage Cooler weighs 48.5 pounds and measures 17.5L x 19D x 31H inches, has a 3.2 cubic feet capacity, is a compact mid-size fridge that will not take up a lot of space but offers plenty of storage space. And it is ideal for public offices, small houses, playrooms and good for commercial use. You will not need to assemble or install anything and can use it as a plug and play type of unit wherever you find a power outlet. You’ll be able to see what drinks you have on the shelves through its clear double paned glass door without having to open it, letting the cool air escape. This will save you on energy bills, as the door offers enough insulation as well. You can easily open and close the door with the recessed handle to get your drinks in and out. There is a blue LED light inside that you can turn on and off manually, when you need to find your beverage. Costway Fridge doesn’t require any assembly but like with any compressor type unit it is best that you let it sit for up to 24 hours before plugging it in. It is an ETL listed and certified product that is safe to use. But it doesn’t run very quietly and you’ll hear it when the compressor is doing the cycles. It looks and feels premium, does the job of cooling very well and is clearly a very good deal for the price.